For years, Goomi has been unleashing his own vision of Cthulhu upon the world, in his comic "The Unspeakable Vault (of Doom)!" 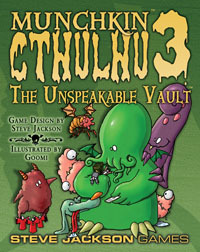 Now his unique take on the Elder Gods comes to Munchkin, in the form of Munchkin Cthulhu 3 - The Unspeakable Vault. This 56-card expansion brings Great Cthulhoo, Dagoon, Narly, and Tindaloo into the pun-filled world of Munchkin. Feed your friends to Cthulhoo, grow Footicles, and use your Inhuman Moan to defeat the Teeny Weeny Mi-Goo. More Things That Put The Hurt On Monsters! Wield the Roman Candle, the giant Hypodermic Needle, and the . . . Can Opener? Sure, why not? After all, this is Munchkin!